Yee-ha! 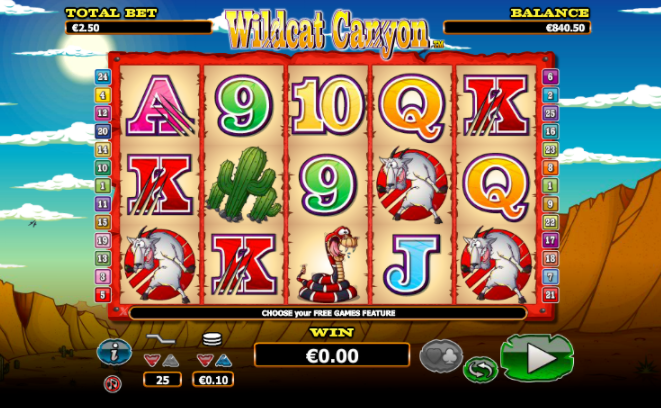 Take a trip down to Wildcat Canyon in this 5 reel slots carnival of coyotes and wilder beasts who are waiting to spoil your fun in this online slot game. Save the desperate animals and round of the wildcats and they will be happy to compensate you for your efforts with some significant rewards and casino bonuses. NextGen gaming is a game developer with over 20 years experience creating popular online slot games for all around the world. NextGen’s focus is to create games that deliver extraordinary entertainment and quality for their clients. The company attracts players though their unique games, entertain their players through the games they provide and retain their players from the stimulating and fun each game provides so they come back time and time again. This gaming developer lives up to its a name and is powering the future gaming industry. There are more NextGen games right here at top slot games. The rocky background puts you at the heart of the Grand Canyon along with some wild animals and plants in this 5-reel 25 payline slot game. 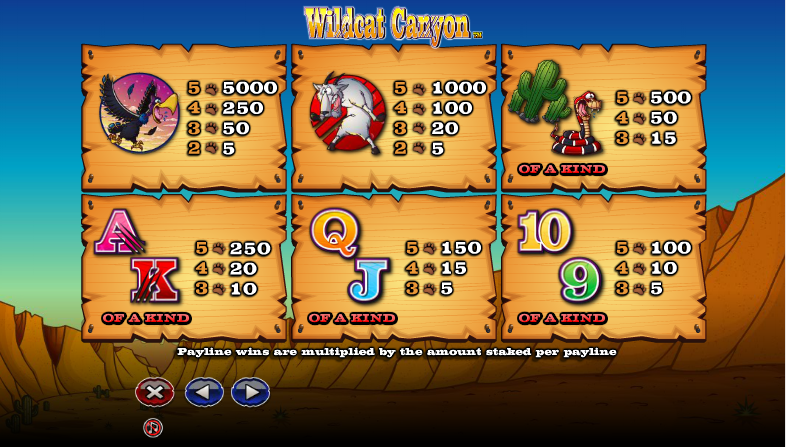 Wildcat Canyon offers a range of special symbols including: a wild symbol, a scatter and special features like Free spins bonus and a gamble feature.! Being wild himself the wildcat acts as the wild symbol in the game which fits his personality well. This symbol can appear on reel 2 and 4 and substitutes all other symbols apart from the scatter symbol. The wildcat is the main character in this game however there are other animals like vultures, donkeys and snakes all worth certain values. Play today and pay by phone casino! The paw print is the scatter symbol in the game, all scatter wins are multiplied by the total bet placed. If you land on 3 or more scatters anywhere on the reels the free spins bonus round will be activated. You will get to choose which feature you want to play once the free spins bonus has been activated. You get to select how many free spins + multiplier you’d like, there will be 3 choices. The first on which is 15 free spins with x3 multipliers for wild wins. The next is 10 free spins and a x5 multiplier wild wins and the final one is 5 free spins with x10 multiplier for wild wins. For any wild that hits on the reel during the feature will be locked in place and you will be granted an additional spin and can be re-triggered. To activate the Gamble feature you must land a winning combination by clicking on the ‘hearts & clubs’ button, you could double or quadruple your winnings. By guessing the colour of the card you can double them and if you guess the correct suit you will quadruple your winnings. Be careful because if you guess wrong to will lose everything and will return to base game. You are only limited to 5 right picks. The game itself is pretty simple but far from boring and is sure to keep you entertained. It’s a great game to play as it is well designed and has a great spin function. Wildcat Canyon is worth a go as it’s one of best slot games NextGen has to offer and has the potential to achieve big winnings and what sane human would want to miss out on that. RTP for Wildcat Canyon is 95.5%. Another amazing game for you to try is our Thunderstruck Slot. Click here to go back to our homepage.